Would I do these building portraits differently now? Probably. It kinda upset me when this pub closed down – it’s one of the few town pubs with character outside and inside. It’s also one of the pubs that I sketched totally on site – for this one I sat on a BUSY! roundabout. All the time tensed up about a car or lorry beeping their horn at me and making me jump! One of the things I truly love about working in ink and watercolour is the joy of getting things right! in this case I was particularly pleased with the hatching marks on the road. No pencil! Straight in there with there with the ink pen! The Star, ironically, was another pub that I sketched entirely on site. Both of these picture recall happy memories sitting on my little stool beside the road. 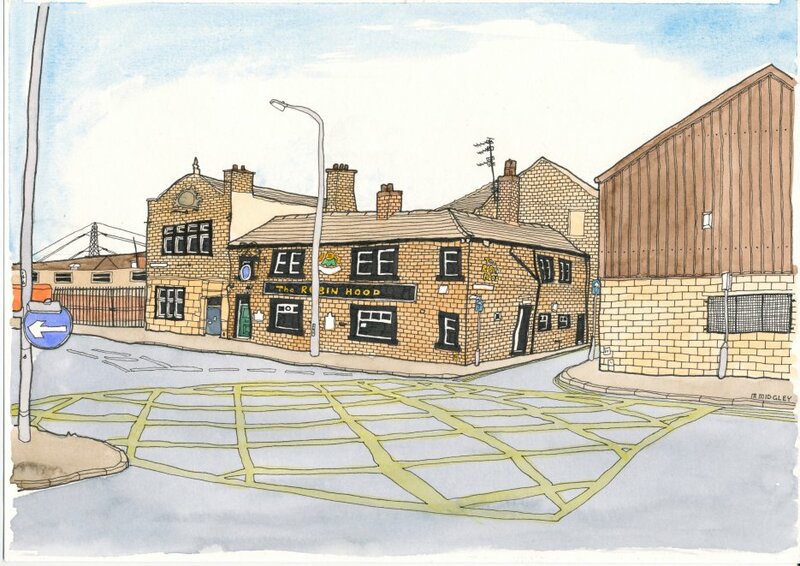 A I drew this pub, the owner came out and asked if he could have a copy of the illustration.